Scofield Thayer, the donor of this work, was not only an avid collector of modern art between 1919 and 1924, but he was also the editor and co-owner of the literary magazine, The Dial, which published the most avant-garde writers and artists of the day. He purchased this picture in 1921 after corresponding with Demuth, who wrote back: "If you feel sure that money and a canvas of mine can 'talk' (I myself have found them so unrelated), at the same pitch, -- well then dear Mr. Thayer, I don't see the way out, and accept your, was it, 'outrageous proposal'." Pictured in the center of this composition is the steeple of the old Center Methodist Episcopal Church in Provincetown, Massachusetts (now the Provincetown Heritage Museum). 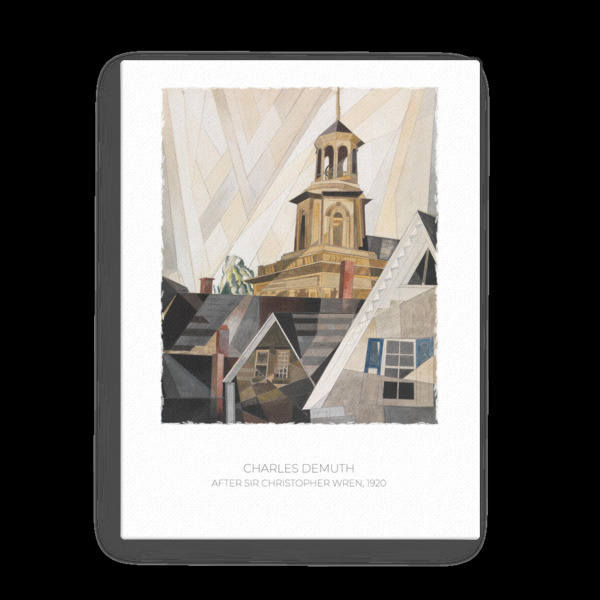 Demuth's Precisionist use of ruled lines, geometric forms, and crossing beams of light, is typical of his architectural paintings and drawings from the 1920s, which more frequently depicted views of the houses, churches, and factories around his hometown of Lancaster, Pennsylvania.